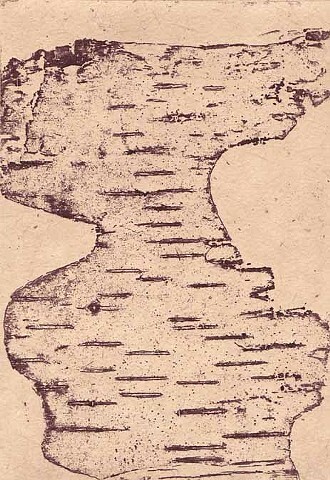 A piece of bark from a white birch yielded the patterns in this print that remind me of an antique map. The bark was pressed into the soft wax covering of a copper plate; The bark lifted the wax to reveal its pattern in the shiny copper. This pattern was then chemically etched into the copper to yield the deeply incised printing plate for this print. The image was printed on thin gampi paper that was adhered to a heavier cotton rag paper during the printing in a process known as chine colle.